I wrote this a bit ago but I came up with some more great ideas. I love the Dollar Tree, and I’m lucky enough to have one a few blocks away. Everytime I enter the store…I am overwhelmed with ideas! I walk down each of the isles scoping out what is new and what I can do with it! Here are some ideas you can do for so much less than buying at craft stores, etc. 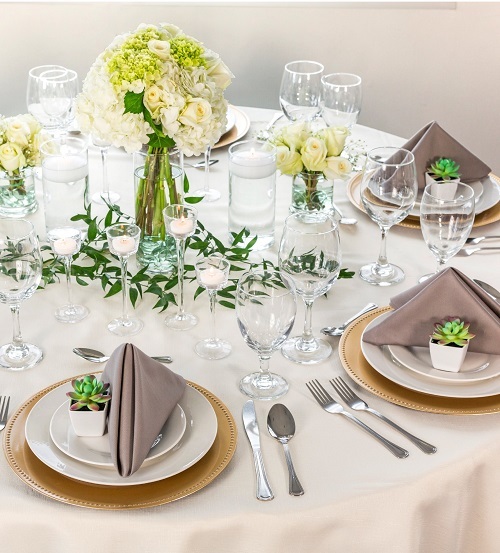 Are you planning a wedding or a big event? Check this out! Add a decorative touch to your table settings with Gold Plastic Charger Plates with Beaded Rims at a low $1 price from DollarTree.com. Plastic chargers have a decorative beaded rim and make a stylish presentation under dinner plates — they’ll be a stunning finishing touch to holiday table settings and reception or event tables for weddings, retirement parties, corporate functions, and so much more! Alternatively, they can be displayed on a wall, used as a base for candles, or even decorated as a gift, craft, or piece of décor. The bottom of each plastic charger is black. For decorative use only — not safe for food service. Not microwave or dishwasher safe. You can purchase everything you see in the picture above…even the succulent! They are also available in Pearlized White. Elegance for less! The possibilities for chalkboards at weddings are endless! They can be used to welcome guests, display your menu, tell your love story, share your social media hashtag, and so much more. 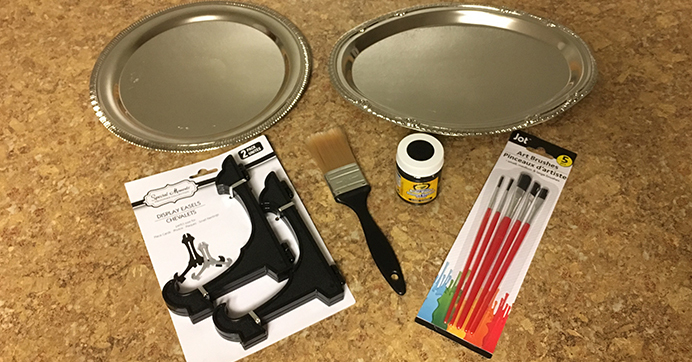 There’s no need to buy expensive chalkboards when you can gather up a few Dollar Tree supplies and create your own for just a few bucks. 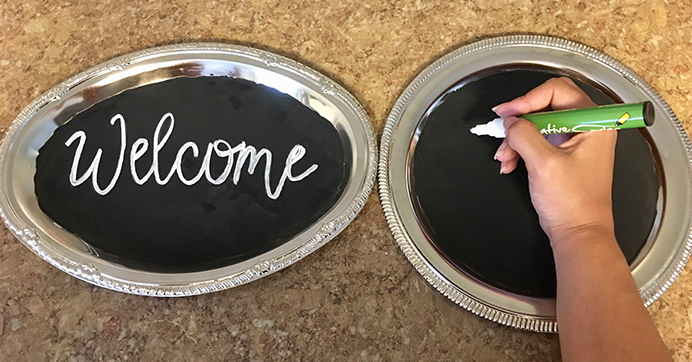 We created a few DIY chalkboard trays to help get you inspired. Recreate this look with black paint, and a nickel-plated serving tray. Host Find Toys, Games, Arts, and Crafts For Only $1 Each! Shop Today! “>crafts night with your wedding party and have some fun crafting and checking one more thing off your wedding to-do list! On the big day, simply use a display easel to prop them up around your ceremony or reception. Wipe your serving tray clean. 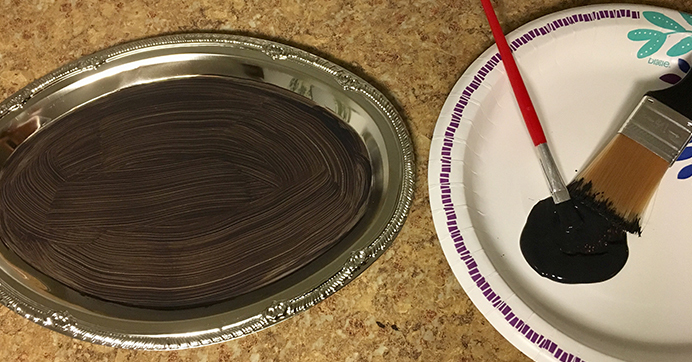 Using your paint brush to paint the center of the tray black, leaving the decorative border unpainted. Allow the paint to dry completely, then paint on a second layer until you achieve full coverage. Once your final paint layer dries completely, use chalk or a chalk pen to write your message directly onto your sign. 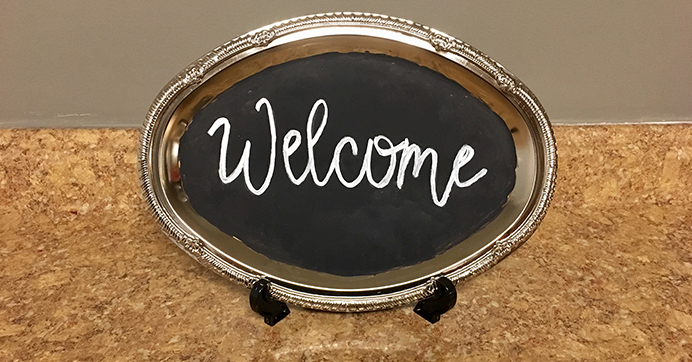 Use a display easel to prop your chalkboard sign up for all your guests to see. Wipe clean with a damp cloth after your wedding day and reuse for future events! Looking for affordable school supplies? You’ve been saved by the bell —Shop the Dollar Tree classroom and stay on budget with teacher supplies from workbooks and flashcards to craft supplies, classroom decorations, storage containers, and more. 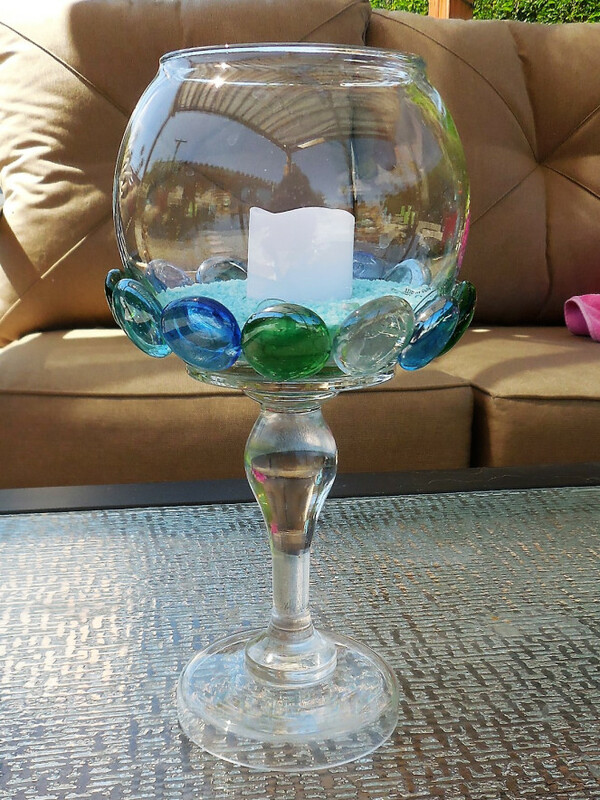 Remember the pretty Glass Gem Candle holder? Below all you need is 3 of these plastic plates, and 2 wine glasses. I have purchased a few of these at the Dollar Store….but I never painted them like this…how pretty! Thinking of kids….Isn’t this a cute idea. You can stencil a pattern on a pillow…isn’t this pretty! Those plastic gloves….isn’t this a cute idea! What can you do with those white clear round glass fillers? modpodge a pic of something onto the back. Add mod podge again to back. When it’s dry, you can glue a magnet to the back and put on fridge! Also in the floral dept. are these square mirrors. Glue them together to create a square, then glue one to the bottom. You now have a beautiful planter. Those round tins you find in the school supplies. They are great to add a magnet to bottom and spices inside. Just put a label on. They charge so much for these containers in a regular store. These trays are painted with chalkboard paint!! You can get so many ideas from this. All of these great ideas were done with supplies from the Dollar Tree. You can find so much online at the Dollar Tree. You get free shipping if you have it shipped to your nearest store. Love them all, especially the chalkboard trays. Aren’t those pretty! Rustoleum puts out a clear chalkboard spray paint that is awesome. I’ll have to check that out, the next time I go to town. They even have the ‘dry erase spray paint’ It is just amazing the products that are out there!! Wow! I need to look around a little more when I’m in different craft sections. I love this! Dollar tree is my favorite store they have everything super cheap and you can find some awesome home DIY materials ! I can’t agree with you more Krazymommy! I wish they had these stores years ago! Some great ideas Kellie – love the mirrored plant holders. Aren’t those pretty!!! Are you going to do the project?